A FORMER VOICE of Ireland contestant has spoken out about the impact of living with sight loss. Rebecca Kelly (27), from Ashford in Co Wicklow, was born with a form of macular degeneration. When she was a baby she was diagnosed with a condition called cone dystrophy, where the eye’s light cells die off slowly from birth. “This is what I’ve know all my life, I don’t know any different. I think it’s a lot harder for people to be born with full sight and lose it over time,” Rebecca said. In general, the condition stabilises at around the age of 21. However, for Rebecca it worsened while she was 22 or 23 and attending college. 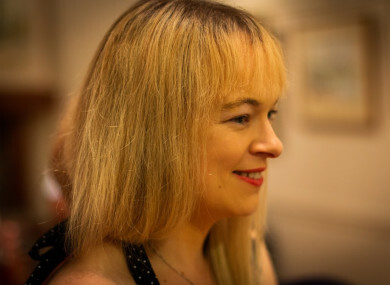 Rebecca said the reading and writing process was slower for her than her classmates but she made it work and graduated with a BA degree in Music from Maynooth University. Rebecca’s father and two of her siblings also live with macular degeneration. She said having family members dealing with similar issues is ”really helpful”. There’s a support network within the family, they know what I’m going through and we can all support each other. Rebecca has 5% vision. There is no treatment for her condition and she uses visual aids to help her deal with everyday challenges, such as a magnifying glass to help her read and binoculars to see things across the road. She also uses an iPad to takes pictures of things she can’t read, zooming in to see the information. Despite the obstacles she faces, Rebecca said she refuses to let her condition define her. Music is a huge outlet for her. She appeared on the Voice of Ireland in 2015, where she got through to the quarter-finals of the televised rounds. She and her siblings sing together and her father Frank helped set up the Visionaries, a choir for people living with blindness or vision impairment. “Singing really lifts the spirit, it helps us feel more connected as a family,” she said. As well as singing, Rebecca plays the piano and the concertina. She also wants to learn the bodrán and the clarinet. Despite the day-to-day challenges she faces, Rebecca said she’s determined to stay positive. I need to keep myself upbeat and in the right headspace. It can be so easy to sniff and say, ‘I can’t do that, I can’t do that, I can’t do that. What am I supposed to do with my life?’ There’s still a lot I can do. For anyone living with visions impairment, she said it’s important to keep busy and seek out activities designed for people with sight loss. “Don’t hide away, the support it there so take it,” she said. Approximately 224,000 people in Ireland are living with vision impairment or blindness. Fighting Blindness is today holding a conference in Dublin, Retina 2018, for people affected by sight loss. Experts n the field as well as hundreds of people with a wide range of vision impairments are set to attend. Former rugby player and Fighting Blindness ambassador Shane Byrne said the event is “a great opportunity to be energised by the experiences of others who have experienced a similar journey and to be inspired by researchers who really are going boldly into the future of vision research”. Byrne’s grandfather, who was a surgeon, lost his sight and hearing in his early 40s. “He didn’t let it stop him. He went on to become the world’s first visually impaired physiotherapist and had another very successful career,” Byrne recalled. Retina 2018, supported by Novartis, is being held at the Radisson Blu Royal Hotel in Dublin city today, more information is available here. World Sight Day is due to take place on 11 October, more details are available here. More information on the services offered by Fighting Blindness can be accessed here. Email “'I don’t know any different': Former Voice of Ireland star refuses to let sight loss hold her back”. Feedback on “'I don’t know any different': Former Voice of Ireland star refuses to let sight loss hold her back”.